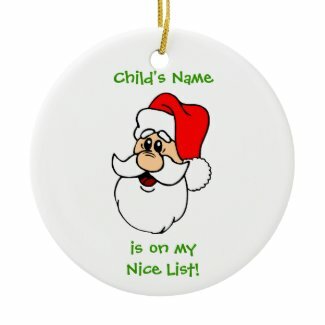 Here are two fun ideas for simple Christmas gifts. 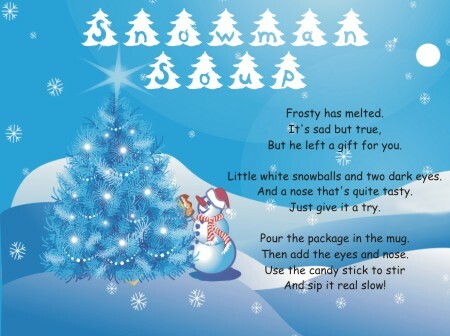 The free printable poems on this page can magically turn marshmallows and cocoa into “snowman soup” or “snowman poop.” All you need is a little imagination, a few ingredients, and these poems. To get a free download with the illustrated poems shown here, simply click the image to open a .pdf file. Each file has four poems on it, so you can cut them out and attach to your gifts. 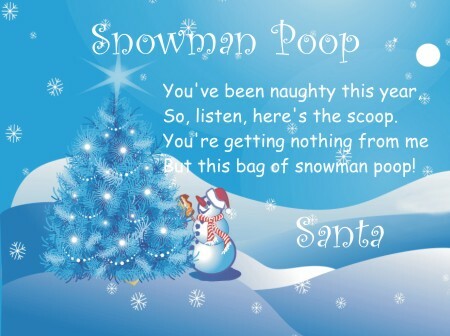 Here are the “recipes” for making snowman soup and snowman poop. But he left a gift for you. Little white snowballs and two dark eyes. And a nose that’s quite tasty. Pour the package in the mug. Then add the eyes and nose. And sip it real slow! So, listen, here’s the scoop.